Customers looking for St Petersburg landscape services can rely on the experienced professionals from Evergreen Total Landscape. Each one of our friendly landscapers goes through all necessary training courses, so our customers can rest assured that their landscaping service will be completed by certified, knowledgeable masters of their craft. We also have a certified pest control operator for customers looking to protect their land from unwanted critters. We have experience performing these services on many different types of properties. From private residences to grocery stores, apartment complexes to restaurants, and everywhere in between, no job is too complex for us. And every site we maintain is actively managed, meaning we do frequent inspections to ensure everything is in pristine condition and will catch the eye of anyone who passes by. 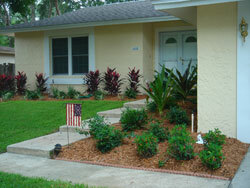 Please call or e-mail us today for more information about our St Petersburg landscape services. We also offer service to customers located in Tampa, Lakeland, Clearwater, and surrounding communities.